NEW Built 2015. Only one of this type. Ground floor. Super King Bed with bedside cabinets. Kitchenette includes Refrigerator/Freezer, Two Electric Hobs, Microwave Oven. Electric Fan Heater and Fan. Bathroom has 2 mitre high shower with electric Towel Rail Double Glazing throughout. Continental Breakfast available on request. 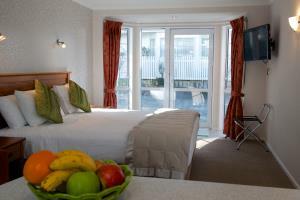 Totally Refurbished in 2017 with new kitchenette, bathroom and high pressure shower. Ground Floor. 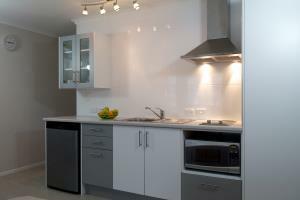 Kitchenette includes Double electric Hob, Refrigerator/Freezer, Electric Fry Pan, Sandwich maker. Bedroom has Queen Bed and Lounge has two single beds that double as day seating. Other facilities include two TVs a USB Charger & Fan. Continental Breakfast available on request at extra charge. NEW 2015. Spacious Ground Floor Studio with two LONG SINGLE BEDS. Kitchenette has double electric hob, Microwave Oven, Refrigerator/Freezer. An Electric wall heater and a Fan are also provided. Large Bathroom with walk in shower. 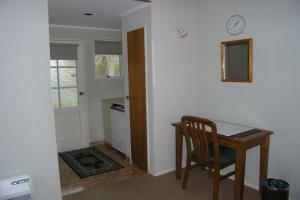 While this unit does not qualify as an Accessible Motel it is ideal for Guests with limited mobility. Continental Breakfast available on request as extra charge. 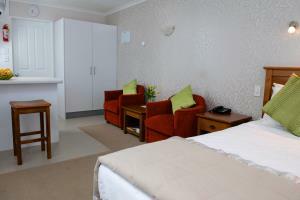 ACCESSIBLE ground floor Motel Totally Refurbished in 2017 with new Kitchenette, bathroom and high pressure shower. Ground Floor. 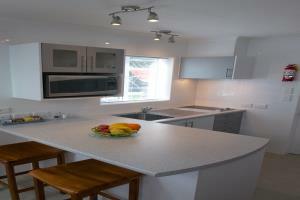 Kitchenette includes Double electric Hob, Refrigerator/Freezer, Electric Fry Pan, Sandwich maker. Bedroom has Queen Bed and Lounge has two single beds that double as day seating. Other facilities include a USB Charger & Fan. Continental Breakfast available on request at extra charge. NEWLY fully refurbished 2018. Spacious Two Story Motel (66 Sq Meters). Has Two Queen Beds and Three Singles. Two Tvs. Bathroom has shower over bath. Kitchen includes 4 Hob Cook Top/ Oven/Electric Fry Pan, Dishwasher and Refrigerator/Freezer. Minimum Stays of 2 nights are generally required. Ideal for families on transfer or longer term stays. Inquire about reduced rates for longer stays. Large two story (67 sq meters) Motel/Apartment set up to sleep up to 8 persons. This has three bedrooms including one bed in the lounge. There are two Queen beds plus 4 singles. There are two TVs. The kitchen has a 4 Hob cook top, an oven, a dishwasher, refrigerator/freezer and electric fry pan. The bathroom has a shower over the bath. 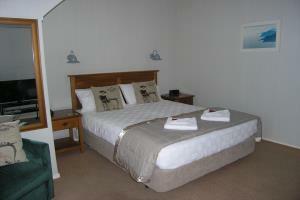 Ideal for large family groups especially those needing a longer stay. Inquire about our longer term rates. Large two story (67 sq meters) Motel/Apartment set up to sleep up to 7 persons. This has three bedrooms including one bed in the lounge. There is one Queen Bed plus 5 singles. There are two TVs. The kitchen has a 4 Hob cook top, an oven, a dishwasher, refrigerator/freezer and electric fry pan. The bathroom has a shower over the bath. 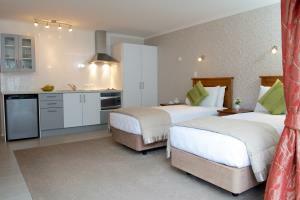 Ideal for large family groups, especially those needing a longer stay. Inquire about our longer term rates. Large two story (67 sq meters) Motel/Apartment set up to sleep up to 6 persons.Totally Refurbished 2018. This has three bedrooms including one bed in the lounge. There is one Queen Bed plus 4 singles. There are two TVs. The kitchen has a 4 Hob cook top, an oven, a dishwasher, refrigerator/freezer and electric fry pan. The bathroom has a shower over the bath. 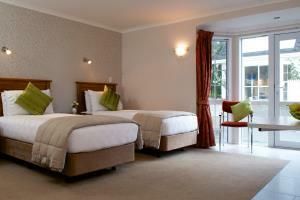 Ideal for large family groups, especially those needing a longer stay. Inquire about our longer term rates.